I want to share with you a model of a Caterpillar. Not of the yellow colored Machinery Brand but of a more natural kind. 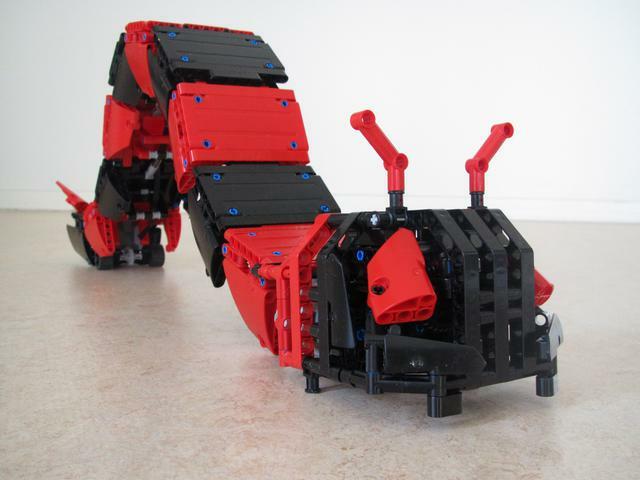 but as that proved to complex regarding the feet movement, it evolved into a more classic Caterpillar. It is operating autonomous with an XL-motor, a switch and a winch/rope mechanisms to operate it. Best way to see it's real operation it by viewing the youtube video. Very impressive! Could you change the gearing to increase the frequency of "flops"? You need to fix the Youtube link though, which is here. Wow I like it even without tracks . Very cool! It's quite enjoyable as it is, but I wonder if you could add something in the tail segment that drops down to add friction when it's flopping/pushing forward and pulls up when it's time to rise and bring the tail forward (and potentially vice-versa in the front, though something just on either of the 2 ends would probably increase its crawling efficiency). Like a fixed rubber wheel or the tip of a Technic shooter dart or something. I like the use of PF for this creation. I explored building a snake controlled by Mindstorms and movement without wheels gets complicated quickly, so a simple solution like yours is very admirable. It's quite a lovely unique creation, don't remember ever seeing anything like it. I love this. I think it may inch its way to the top of my "to-build" list. Rather impressive/unique/novel. I tried to build something similar a while back, but was thinking of using a 'wave', a bit similar to the motion of a snake on sand, but in only one dimension. Struggled for a while to get the mechanism to work but gave up. I like what you've done, winches and springs is rather ingenious, let alone the flip switching switch flipping mechanism!. 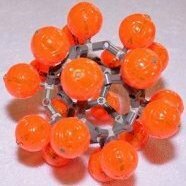 Is this the beginning of Bionic Lego (motions that mimic real-life / nature) ? I'm trying to build the model in LDD. One question: Are all the segments the same or are there small variations? Your instructions give step-by-step for each segment, but I was not able to detect differences. This is truly incredible, I just love real life replicating MOCs, thanks for sharing your creation with us. There already is a one-way direction wheel in the back that ensures that it does not move back a lot, but an additional one in the front proved difficult. Getting enough friction is tough anyway. I woudld be reaaly thrilled if you could build it in LDD, I don't have the patience for that . All segement are very similar, but except 2, all are slightly different, due to the winch mechanism or the drive train. Differences are however small, basic structure is the same. Ah, OK. And that is a much simpler way to approach it than where my brain was going. I would be really thrilled if you could build it in LDD, I don't have the patience for that . All segement are very similar, but except 2, all are slightly different, due to the winch mechanism or the drive train. Differences are however small, basic structure is the same. Working on it and should have soon. I already did near 90% and then LDD crashed on me . Have to restart from scratch but will go faster this time. My daughter says I have to build that now. Here is the LXF. I made small changes because of LDD's anti-collision constraints. There were also few parts I could not put in the right place, because of LDD's requirements too. Hope this is useful, and now I need to build the real thing. Thanks again for sharing such fantastic MOC. I also found one small discrepancy in the photo-build instructions. The last few pages show a rubber wheel in the worm's head, and such wheel is not there on the instructions for building the head. Fixing this in LDD was easy, but in an actual physical Lego model, one might need to disassemble few parts. Unfortunately the link says file is not yet public, could you check? Good observation on the wheel. It was a leftover from my attempt to also place a one-direction movement in hte head, but it didn't work good enough. It indeed is not part of the needed file. Martinj: Very welcome, Thank YOU for sharing such a unique masterpiece. 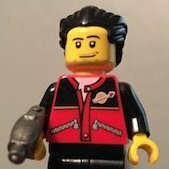 All: It seems the file is not made public yet by brickshelf. It usually takes a couple of days. If you need the file sooner, send me a message and I'll email it to you. That link is to the folder, and has to wait for moderation. Brickshelf deeplinks (the ones ending in a filetype) work immediately. I know how to deeplink photos, but an LXF file, not sure that's possible. Do you know how?